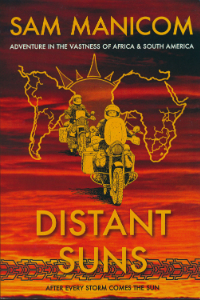 Distant Suns is also available on Kindle. The Distant Suns Audiobook is now available as a CD direct from this site. It is also available to download from Audible, i-Tunes and many other outlets. …I was thoroughly enjoying adventuring on a motorcycle. The freedom the bike gave me was phenomenal and the adventures she got me into never stopped rolling. I was loving it, and I wanted more! Could I keep going? Was there any good reason to stop? I could and there wasn’t, and after the next three years adventuring across the Antipodes, Asia and the Middle East, I was even hungrier for more. South America was the new dream, and when I realised that I could scrape enough money together to keep going, the adventure continued to roll. When my guardian angel was there for us, the journey was a combination of laughter, adrenaline burning fun and pure awe. Suddenly, her bike leapt wildly over a set of heat heaves and she was instantly heading straight for the scrub-covered verge! …I could see her grabbing her brakes with every bit of strength she had and I could see how her eyes were wide with fear. The bike was skipping madly and I was sure she was about to come a cropper, big time. But no, with surprising strength and huge willpower she managed to pull her bike to a halt, just short of the ditch. When I got to her she was sitting on the bike shaking with the after effect of effort and fear. She said, ‘I can’t do this!’ and tears rolled down her face. They weren’t tears of fear, they were tears of frustration that she’d even thought, ‘I can’t do this’.